The reward for this quest is Galvadon. Only spells that target a specific friendly minion will count towards the quest! Cards such as Avenge or Competitive Spirit will not work. You are able to choose the same Adaption multiple times. Join the discussion on our forums! 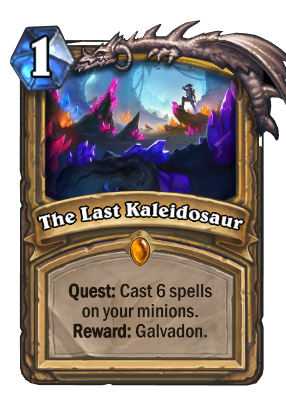 Come discuss The Last Kaleidosaur over in our dedicated The Last Kaleidosaur discussion topic. Sorry if it's considered annoying to just drop deck lists in the comment, but I think the quest has potential, maybe not for laddering, but at least as a really fun deck to play in casual. With WW, Sound the Bells! allows the deck to play as a control deck, because you no longer have to stuff the deck with bad spells since sound the bells! [card] has echo. With [card]wild pyromancer, Sound the Bells! also becomes a Warpath with a body. Rebuke allows you to protect your board the turn you play your massive lynessa sunsorrw or Galvadon. So far, this deck has won me every game against spiteful decks, because Equality and Sunkeeper Tarim is so good against their spiteful turn, and the deck has so much healing potential in the later stages of the game through stuff like Paragon of Light. I really tried to make this work, but simply can't get more than 40% of wins with it in Rank 10. The problem with this archetype is that you are basically building a deck and playing a strategy just for two cards that will not be played before turn 7, and whose effect can be easily nullified/slowed with plenty of stuff played on the meta right now. Most of the time you'll be scared of silencing/direct removal like Spellbreaker, Voodoo Doll, Hex, Sap, Polymorph and board removal like Brawl and Psychic Scream. 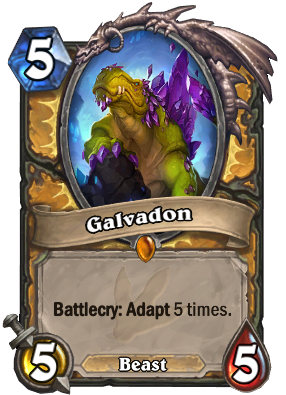 And if you really decide to select 2 of Galvadon's adapts as Stealth and "Can't be target of spells", you can either get lucky with the board state and manage to make him live for a turn to do 10-22 damage to the opponent's face with windfury, or will have to use him to trade with usually 2 minions, which is pretty underwhelming for a minion that required so much investment. Yeah, this deck can be fun and pretty satisfying to win with, and Lynessa Sunsorrow is cool as hell (usually having better performance than Galvadon, despite still having the same weakness as him), but to actually be competitive this archetype needs way more cards than what we have right now that synergize with this particular strategy of buffing lots of times. And what makes this worse is that all of the current cards that do are either epic or legendary. The deck I'm using is included below, in case someone wants to share some help. Not having much luck with it, mixing it with Barnes is pretty fun to experiment with with my current cards. He's not that bad if you don't die turn 4. I just unpacked a golden copy of this in a free Un'Goro pack that I got from the Year of the Raven celebration. Gotta say, this card is a lot of fun to make gimmicky decks with! I've had a lot of fun in wild and standard with this card, and it's really fun to experiment with in aggro or control archetypes, it can fit either. Really a neat card that's just too underwhelming for standard. Edit: Never freaken mind I love the quest and Galvadon Stealth + windfury + attack buffs = ded face and playing the deck itself is fun as heck! Yes, this card is trash. Even if you do manage to get it done before dying, Galvadon is garbage. Got this 1 month ago. Never played yet. This card is bad even on rank 20. I won't say it's not bad, cause that would be exaggerating, but with a Control deck with a few buffs and this card, I've win streaked a few times from rank 20 to 15. Harder to tell where it'll go from there though. You could autofill a random deck and streak from 20 to 15. Haven't seen this card anywhere in game, so decided to try in latest Tavern Brawl, since decks there are not so toxic. And... this card is awful. Like really bad. Like it makes you mad, then you get the quest done, bad. Sometimes you don't get neither Divine Shield or Stealth once in 5 picks. That is just really-really awful. It guarantees not ever a good swing of game, I'm not even talking about a winning position. This is really the worst quest of all classes - and, yes - even worse, than Warlock's.